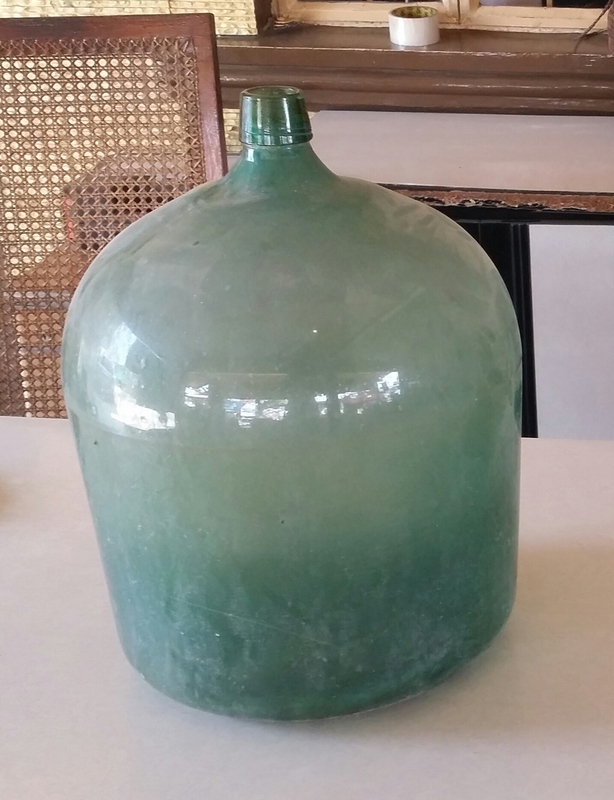 Dama Juana Bottles or Demijohn bottles are large spherical bottles made from glass or earthenware. It is used a container for different types of liquids. The bottles are usually wrapped or encased with plastic or wooven material. Here in the Philippines it is usually wrapped with rattan. Rattan is a tree and the part that is used is the skin of the bark of the tree. A wooden cork is used to plug the hole at the top. 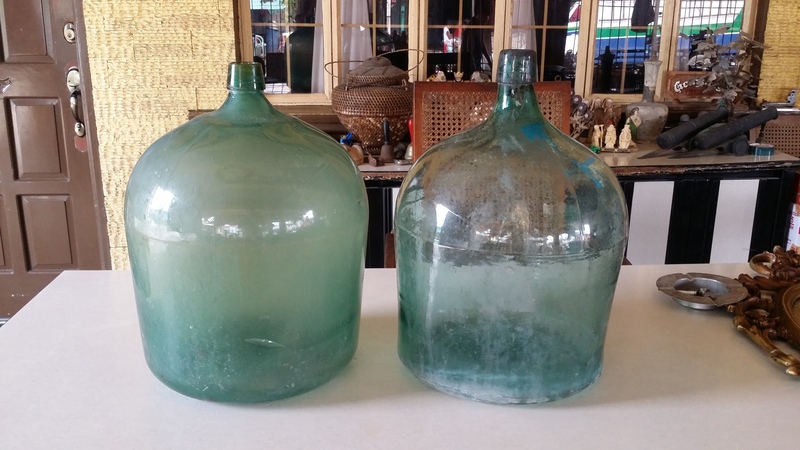 Dama Juana Bottles or Demijohn bottles I think was first introduced here in the Philippines by Spain. During the Spanish colonization of the Philippines. Since I didnt have much knowleagde regarding the dama juana bottles I asked some of my older ralatives on how it was being used. 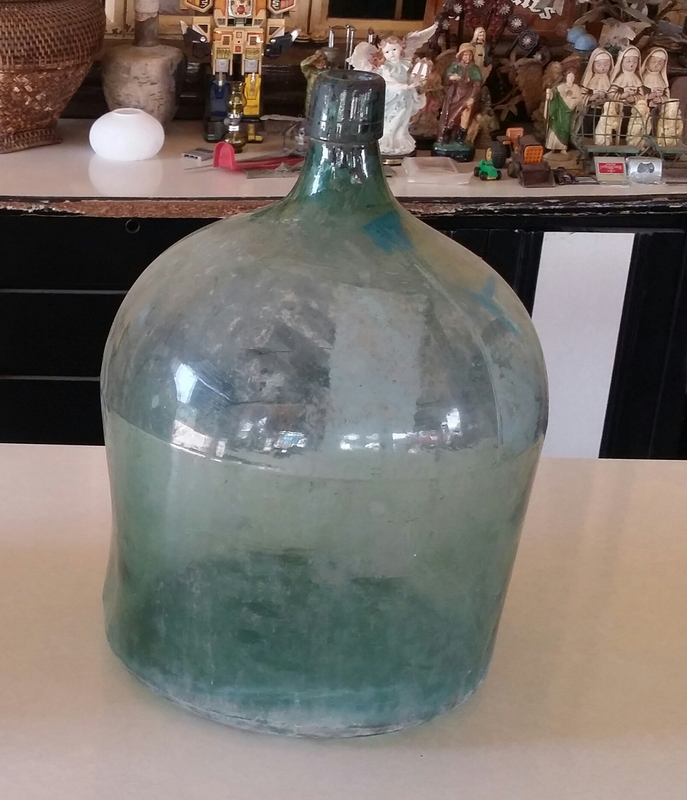 They said to me that Dama Juana Bottles were used in storing certain liquids like vinegar, tuba, and lambanog. According to them the wrapping of these bottles was an art. And there were different designs and techniques for wrapping the dama juana bottles. Unfortunately for me I wasnt able to experience how it was used firsthand. All the dama juana bottles that I see now are either used a displays or are being sold to collectors. fortunately for me I was able to get two of them. I first started looking for it around december last year and I was only able to get my first one last March 2015. The glass was a light blue color and it was very dirty at that time. The height of it was 18-19 inches and the diameter was around 8-10 inches. I really felt happy that I was finally able to get one. Also it was brought to me by one of my workers (magbobote.) He said to me that a man called him and asked him to clean his backyard of trash. So he did just that, and he saw this huge bottle and thought that maybe I am interested in it. So he asked the owner if he could have it and the owner gave it him. He didnt have any idea that the bottle is the Dama Juana That I was looking for. The second one is a green colored dama juana bottle. It is almosy the same siza as the first one. I got this one from a different worker of mine. He said that the previous owner used to sell vinegar in their sari sari store it is like a mini mart. An the store closed in the 70’s. The sad thing about it was that they had quite a few of these bottles but only one survived the others either had a crack or was completely broken. The only thing that I wasnt able to get was the wrappings that was used for the bottles.